Plan for late January – early February. Yellowstone during the winter offers a unique view on the park opposed to the late spring/summer months. You will find far less tourists, in fact only about 125,000 total people visit Yellowstone during the winter months. That is less than 5% of their annual visitors. Late January-early February offers massive depths of snow giving you the perfect winter wonderland. If you go too early you may find there isn’t enough snow to enjoy your experience. Go for the snowmobile. During the winter months cars are prohibited inside the park, and you are only allowed in with a guide either via snowmobile or with a snowcoach tour (larger groups inside a small tour bus with snow tracks). I would only recommend using snowmobiles to view the park, even if you have a few in your group who can’t drive they can be passengers on your snowmobiles. Traveling by snowmobile provides the most options – and you will surely find yourself driving within 6 feet of bison. Don’t forget to look for snowmobile guides/rentals off the beaten track. Our group chose to use a small private tour off the beaten track inside the park. Our guide Jay was phenomenal. He took us to parts other groups missed and with the flair of a former Alaskan hunting guide – his stories never ended. You can of course book package deals with hotels in town (Holiday Inn) or book with one of the larger tour groups in town, but don’t forget to seek outside, smaller tour guides for variety. Rent the lens you need. I primarily used two lenses in Yellowstone: my go to Nikon 14-24mm wide angle landscape lens, and the rented Nikon 300mm lens for wildlife photography. I always recommend to do your research for the types of photos you are looking for, research the type of lens needed and rent. If you can’t afford to purchase the lens, head over to one of the many lens rental websites and borrow that perfect lens for a week. You won’t be disappointed. I see far too many photos using inferior glass – spend the extra $150-200 and make your trip perfect. In Yellowstone you will find plenty of opportunities to photograph bison, bald eagles, coyotes, and if your lucky the occasional wolf. Plan for 2-3 days of snowmobiling. Yellowstone really needs two days of snowmobiling to see the majority of the park in the winter. Most visitors overlook the option of the third day to take the snowmobiles outside the park. This gives you the option of having fun in less traveled areas, you may not see as much wildlife – but it sure will be worth the fun. After three long days in the cold you will have had plenty of snowmobile time and will look forward to driving in a warm car. Dress the part. All of the snowmobile rentals in Yellowstone will provide you with the proper gear: helmet, gloves, boots and a full body jumpsuit. For the most part this gear is excellent. Riding for long periods at a time gets cold, very cold. Even with heated handlebars and heated seats you will feel the bitter cold of Yellowstone in the winter. Come prepared and dress warm by adding quality thermal layers underneath your jumpsuit. Also bring a cold weather facemask for under your helmet. One member of our group had high quality winter boots he wore instead of the boots provided – he was warmer than all of us. My boots were standard, but the cold can get to you – don’t arrive expecting to be 100% dressed. Bring your layers, bring extra gloves, and wear good face protection. You want to be able to enjoy your trip – not complaining you’re ready to pack it in after an hour in the snow. In the end I promote Yellowstone National Park in the winter as an entirely different experience than Yellowstone any other time of year. In fact, because I grow irritated with large crowds during the summer – I promote is as a better experience than during the summer. 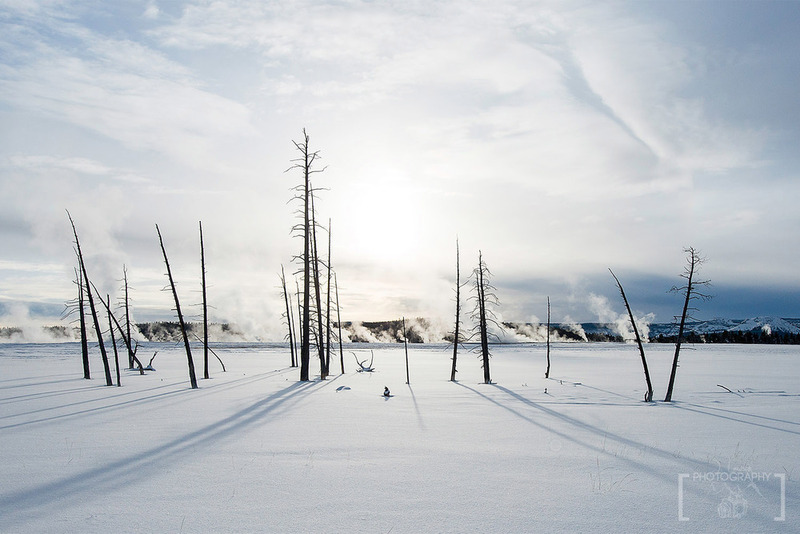 If you haven’t been to Yellowstone at all, don’t hesitate to make winter your first experience. You won’t be disappointed. If you like this article, please head over to follow me on 500px, Google+, Twitter or Pinterest for more travel tips and landscape photography.